Within the Calex range of infrared temperature sensors is the ST680 Series of high-quality handheld thermometers with laser sighting and large backlit LCD display. The instruments measure in a wide temperature range from -50 to 1000°C with 0,1°C resolution. The series also offers a superior 50:1 field of view which helps to minimise errors by producing a small diameter measurement area. 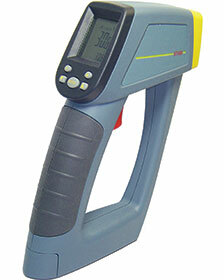 The model ST689 accepts inputs for type K thermocouples and has a USB data output. The emissivity setting is adjustable from 0,1 to 1 and all models provide adjustable audible alarms. Readings can be taken in either °C or °F, and when the trigger is released the last measurement is held for approximately six seconds before the unit automatically turns off. The instruments operate in ambient temperatures from 0 to 50°C and are powered by a standard PP3 9V battery. Each device is supplied complete with a soft carrying case. Alien Systems & Technologies (AST) offers a wide range of automatic fire detection systems from advanced ultra-smart addressable point type detection systems to regular conventional systems.